In this 2010 Wii exclusive flying game, young pilots uncover hidden corporate initiatives. The engaging storyline originates from a 2008 Mamoru Oshii directed anime film titled The Sky Crawlers (rated PG-13). That, in turn, is based on Hiroshi Mori’s series of book of the same name, which began in 2001. Players maneuver propeller fighter planes in an alternate world as Lynx, who gets action and mystery in his role as a new pilot for the Rostock Corporation, “a war commissioning enterprise.” Maumi Orishina, and her love for flying, also has a prominent role in the story mode, which includes 18 missions. Each mission involves an initial briefing then choice of plane/weapon set. You can earn unlockables which allow customization of engine, wing, armor, weapon, and cockpit components. The actual location where this customizing takes place is a hangar with some cool stylistic shadows, but a well lit area would have been better for the customizing activities. Objectives in the missions have time limits based on the difficulty level chosen. Upon finishing a mission, players get a results screen which includes a replay option and performance grades (a high S, A, B, C, or low D). The thorough tutorial takes about 15 to 20 minutes. The free mission mode features mission replays where players can enjoy witnessing once more their hard earned achievements. There is a data viewer which contains battle records, earned medals, saved replay clips, and other content. A two player mode feature exists, but it’s a Wii remote-only assist by the second player who controls a secondary gun in a simple point and shoot style. The game allows for up to three save files to manage progress. One can progress more quickly in the game by skipping cut scenes, but the high quality story content warrants multiple viewings. It is during the “night sky” second mission in the story mode where one’s expectations for the game truly get established. In the mission, one’s blood is always pumping and there are some great dogfight and combat scenarios. The sharp graphics capture the characters’ fierce flight passions. Smooth controls and epic landscapes blend perfectly with the well developed maneuvers, which never slow down or freeze during gameplay. The control scheme uses the nunchuk (right hand) for movement and firing (Z button) with the remote (left hand) for throttle and detailed functions like slowing down (B button). You can use the remote to cycle through targets with the directional pad or just take the automatic choices as eliminated targets rotate out. This scheme expands somewhat depending on the type of difficulty of controls chosen — beginner, normal, or expert. And, if that’s too much you can always just use the classic or GameCube controllers. The shoot ‘em up action requires minimal awareness. For example, make sure the cannons don’t overheat (keep checking the ammo display in the upper right). Bomb options with helpful vertical target graphics ensure land targets are never forgotten. The main challenge becomes multitasking as the learning curve involves remembering button functions and combinations. When tailing the enemy, you can earn Tactical Maneuver Commands (TMCs), special automatic moves activated by press in the A button when the TMC gauge (bottom middle display) fills. These moves work with an enemy within radar range, shown in the display on the bottom left. Lose the enemy. Lose the TMC. The intuitive heads-up display (which can also be adjusted in the screen settings) works well. Authentic flight sounds and radio chatter enhance the smooth control experience. The camera perspective changes from a first person cockpit view to third person views, which are most effective during player initiated TMC cut scenes. 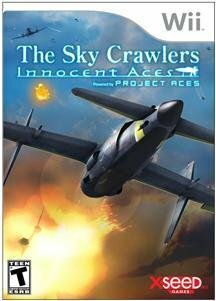 Powered by Project Aces, developer of the Ace Combat flight combat game series, Sky Crawlers: Innocent Aces is an excellent flight simulator/aerial combat game for the Wii. One can choose to delve into the highly customizable options or skip them, the difference is minimal…as long as you stay in the easy difficulty. Experienced aces have several challenges and replayable missions within the game, which is certainly a great experience at a $29.99 suggested retail price. The Wii’s optional airplane controller stand may further enhance the game’s control style as well. This entry was posted in Video Game Reviews and tagged Games, Michael Siebenaler, Mike Siebenaler, Skycrawlers, Tall Writer, video games, Wii. Bookmark the permalink.